Data Everywhere gives you an easy, flexible, and powerful way to reference and share data between Google Sheets and a Microsoft Excel spreadsheet. If you don't already have our Google Sheets add-on, you should read the Google Sheets add-on installation instructions to get it installed before continuing. You will also want to install the Excel for Windows add-in if you haven't already. Once you have data you'd like to publish out of Google Sheets and use in Excel, we'll want to share this data using the Data Everywhere add-on. Note that "sharing" the data might mean you only share it with yourself. Your data is private unless you explicitly share it with others. 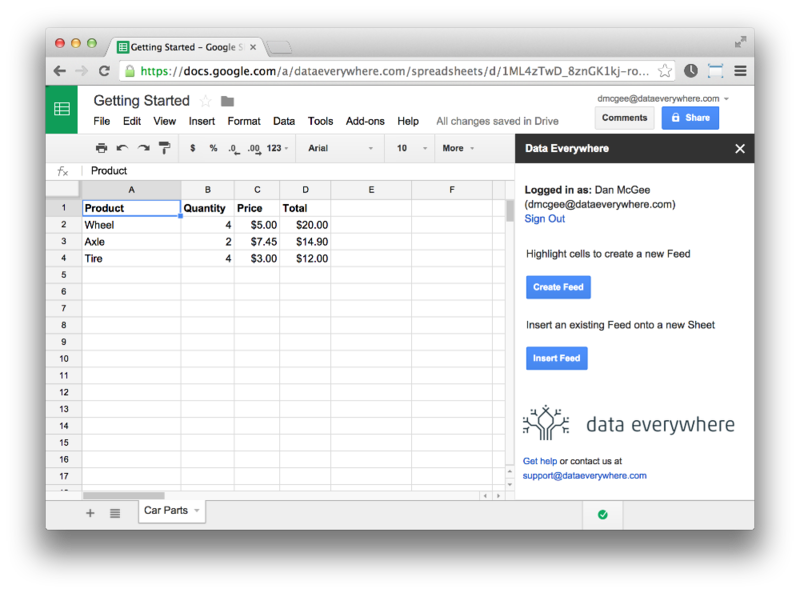 Start by navigating to the Google Sheets document you want to share data from. If you have the add-on installed but cannot see the sidebar, select the "Add-ons" menu, then "Data Everywhere", then "Start". Select the cells containing the data you wish to share and choose "Create Feed" in the Data Everywhere sidebar. Give it a descriptive name so you can find it later, then click the "Create Feed" button at the bottom of the dialog. Your data has now been shared! This data can now be inserted in an Excel Spreadsheet. Continue by opening Microsoft Excel if it isn't already. If you wish to insert the data in an existing workbook, open that now. You can also start with a blank workbook. Switch to the Data Everywhere ribbon inside Excel, and click on the "Insert Feed" button. You should see the feed you created earlier listed by name. Select the feed and click the "Insert" button. There are additional options at the bottom of the dialog box, but the defaults should be fine for most users. Your data is now linked between Google Sheets and Excel! When you change the data in Google Sheets and click "Publish" for your feed, the Excel workbook containing your feed, if open, will prompt you that an update is available and you should refresh the data. If the workbook is not open, it will prompt you after opening and signing into Data Everywhere that a new revision is available.